RHYS BOWEN: I'm really torn about Suzanne Adair's blog. I mean, as a native Brit I should be cheering for the Redcoats, right? But as a naturalized American I should see them as bloody foreign invaders trying to rob me of my freedom. And the truth is that they were ordinary men, pressed into a role they didn't want. That's really true for all wars, isn't it? The foot soldier is a puppet, dancing to his master's grand designs, be they good or evil. Only now and then are the soldiers part of the general's vision--as those who fought with Washington in the revolutionary war, or most men who joined up in WWII, fighting with a clear cause. Anway, read Suzanne's interesting take on the Redcoats and maybe you'll feel differently about them.... take it away, Suzanne. 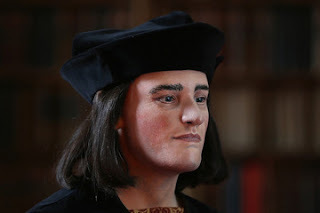 Early February 2013, people worldwide were amazed by news that a skeleton unearthed from beneath a parking lot in England was that of King Richard III, unhorsed and slain during battle with his rival, Henry Tudor. Also amazing was the reconstruction of Richard’s head: that of an attractive man in his early thirties. The main reason for all this amazement over the “king in the car park” was because he wasn’t the Richard we’d expected to find. Henry Tudor, the victor in that battle more than 500 years ago, had conducted one of history’s most successful smear campaigns. After Richard’s death, his supporters were silenced, slain, or banished. His portraits were altered to show a surly sourpuss in his fifties. Richard was blamed for the disappearance and presumed execution of his nephews. Shakespeare, sucking up to the Tudors, hacked Richard’s character for his eponymous play, turning him into a Quasimodo-esque, black-hearted troll on horseback. For the next 500 years, most people believed King Richard III was a monstrosity, body and soul. It was smear campaign crap. Whenever I conduct research for my mystery series set during the American Revolution, I open whole barrels of smear campaign crap, and I’m reminded of the saying that the victors write history. What American citizen who has sat through history class hasn’t been baptized with the stereotype of redcoats? Men of rank and file who were stupid brutes, who’d been forced into service as boys, who had to be flogged into obedience—redcoats, right? Hollywood sure gets a lot of mileage out of that stereotype. So here’s the truth. Redcoats in Revolutionary America weren’t shanghaied; they volunteered as adults. About 20% brought wives and children with them. Fewer than 3% of enlisted men were ever flogged for a crime. Reading, writing, and arithmetic were deemed so valuable that soldiers with an education could hire themselves out as tutors to their fellows. Some regiments even set up schools to teach men the basics. Armed with common sense, anyone who contemplates history for more than a few seconds realizes that the stereotype of redcoats couldn’t have been accurate. Otherwise, the Revolutionary War would have been over within a year instead of pulverizing America for eight years. If you believe that an army of knuckle-draggers in scarlet coats could resist Napoleon’s machine a few decades later, you’d also believe that a hunchbacked king could wear armor, control his charging warhorse, and fight like a tiger. Great! I have some land to sell you. I’ve created a redcoat detective, Michael Stoddard, to bridge the gap in common sense. He and the fellows he works with in his regiment are ordinary guys, soldiers stationed in a strategically-located town. You know, doing their duty to their country, trying to keep the peace, all-too-aware that they’re on foreign soil and among people who resent their presence. The eerie familiarity of that scenario isn’t accidental. You see, not only is history written by the victors. History repeats itself. In the news every day. Which smear campaign in history gets your back up? Award-winning novelist Suzanne Adair is a Florida native who lives in a two hundred-year-old city at the edge of the North Carolina Piedmont, named for an English explorer who was beheaded. 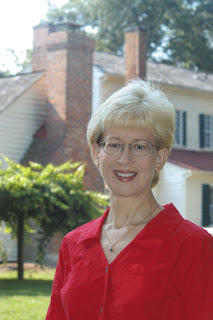 Her suspense and thrillers transport readers to the Southern theater of the Revolutionary War, where she brings historic towns, battles, and people to life. She fuels her creativity with Revolutionary War reenacting and visits to historic sites. When she’s not writing, she enjoys cooking, dancing, hiking, and spending time with her family. 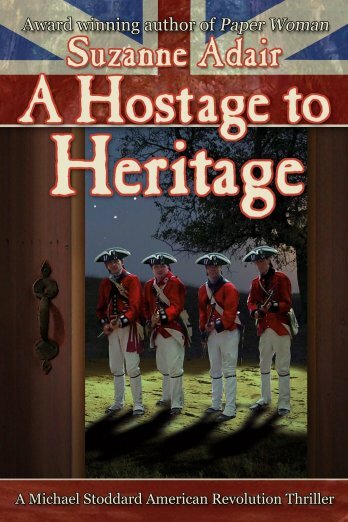 A Hostage to Heritage, her next Michael Stoddard American Revolution thriller, was released April 2013. A boy kidnapped for ransom. And a madman who didn't bargain on Michael Stoddard's tenacity. Spring 1781. The American Revolution enters its seventh grueling year. In Wilmington, North Carolina, redcoat investigator Lieutenant Michael Stoddard expects to round up two miscreants before Lord Cornwallis's army arrives for supplies. But his quarries' trail crosses with that of a criminal who has abducted a high-profile English heir. Michael's efforts to track down the boy plunge him into a twilight of terror from radical insurrectionists, whiskey smugglers, and snarled secrets out of his own past in Yorkshire. It is fascinating to travel to Nova Scotia and read the stories of the Loyalists who were forced to emigrate from the rebelling colonies to lands still controlled by the Crown (and then to read the stories of the native French-speakers who were forced to emigrate from Nova Scotia and New Brunswick to southern bayou country because that was still part of France's "new World" territories). In the victor's rewrites of history not only are the defeated blackwashed, but the victors are whitewashed like George (I cannot tell a lie) Washington. Sometimes though smear campaigns, like the one applied to Joan d'Arc, backfire in the end and the victim becomes a saint. Thanks for your comments, James. Thanks also for pointing out parallel issues between 18th- and 21st-c warfare. I have a whole essay devoted to that concept coming up this Wednesday, on The River Time blog. And because of the blackwashed/whitewashed issue, often you have to read between the lines to figure out what really happened in history. Civilians living outside the cities had such a hard time. In fact, most cities during the time of the Revolution weren't large enough to provide protection from a military force, so the safest place for many civilians was following an army. The power of partisans was difficult to control. Cornwallis never did "get it" how to work with them. However, one of the few times that the British were successful at gaining the cooperation of militias was during the Crown forces occupation of Wilmington, North Carolina in 1781. I'm exploring that (as well as a connection to Nova Scotia) in the Michael Stoddard series. What a fun read this morning. Thanks ladies! I was taught (too long ago to mention) those nasty red coats were all German mercenaries, or British criminals offered an alternative to prison. Ha. I will definitely put this on the TBR pile. My beloved high school history teacher was big on primary source materials, with one caveat. "Always consider the source," she said, over and over. Makes sense, doesn't it? Austin, it's amazing how those misconceptions keep making the circuit. German mercenaries like the Hessians did figure importantly in King George's army. They had their own units and uniforms. Some redcoats did come from the Prison Exchange Program ;-). But not by any stretch were these all of the army. "Always consider the source." Great advice, Bev, and I know you take it. Josephine Tey introduced me to the concept of "Tonypandy" in her book The Daughter of Time, a rousing defense of Richard III. Hello, Suzanne. Thank you for sharing here at JRW. I have recently jumped with both feet into reading historical fiction. The series I just finished has delved into the American Revolution and, like countless others, I'm eagerly awaiting the next edition. All historical novels inspire me to look deeper into the actual truth of the events. You've now given me another series to explore and these are definitely on by TBR list. Smear campaigns! At the risk of opening up recent political wounds I'd have to say the "swiftboating" of John Kerry was pretty horrendous. Liz, The Daughter of Time was good, wasn't it? I found myself following the footsteps of Tey's detective on a few of the points, just to make sure the author had done her research. The evidence she presented was so compelling and clear that I wondered why nobody had connected the dots for 500 years. Then I realized that Tey had collected the data and connected all those dots for me. Not many people in 500 years had had the opportunity to do so. Scattered and destroyed data are what help sustain smear campaigns. Marianne, thanks for your thoughts. Kerry sure went through the wringer, didn't he? Every time I see a modern smear campaign like that, I realize what a boon the Internet and telecommunications has been in spreading smears. But Kerry, now Secretary of State, has certainly fared better than most. Winners always write history. The complexities of the American Revolution have fascinated me since, as a teenager, I first read Kenneth Roberts's novels presenting the war from the sides of both the revolutionaries and the loyalists. PlumGaga, yes, a nod to Kenneth Roberts. He was one of the first authors to run against the wind and take the point of view of loyalists and redcoats. The Daughter of Time was fascinating, wasn't it? I get so aggravated with people who bend the truth to get the results they want. For years Vietnam vets were characterized as troubled men, possibly demented, could snap at any time. Yeah, there were a few of those, but the majority came home, rejoined us civilians, and were productive people. It isn't right to demonize the soldier in an unpopular war. For "way back in history" smears, Richard III wins. Ever since I read Josephine Tey's Daughter of Time I've been totally convinced. But people are so entrenched with what they think is "true", it is very hard to shift beliefs. Pat D, do you know that in its day, the American War was just as unpopular among Britons as the Vietnam War was among Americans (and for similar reasons)? The reintegration problems faced by Vietnam vets were similar to those faced by British soldiers who returned to Britain after their time of duty was over and decided not to reenlist. Drug problems? Alcohol, of course, but also some opium addictions. Libby, yes, we have a culture that reinforces the validity of smear campaigns. As long as there are grounds to see the recipient of the campaign as "the other," an alien, the smear persists. Native Americans were historically caricatured as bloodthirsty savages. Now they are caricatured as wise shamans. The truth is that they are people with individual variations, strengths and weaknesses like everyone else. In the American revolutionary period I understand that there was disagreement among the various Indian nations about whether it was better for their people to gamble on the good intentions of some of the revolutionaries or go with the British. Linda Frankel, yes, Native Americans were blackwashed, then whitewashed. They're still stuck in myth for most Americans. During the colonial period, the British government made treaties with Indians, agreeing to respect their lands. Indian attacks occurred as a result of colonists ignoring the boundaries set by treaties and settling in or otherwise using land designated for Indians. Colonists pressured Britain to punish the Indians. Britain punished colonists when it caught them crossing the boundaries. But it was a huge backcountry with hundreds and hundreds of miles of wilderness borders. So the situation was volatile. Most Indians actually supported Britain. Britain was more responsive to Indians than Continental Congress and made solid efforts to uphold the treaties. Those Indians who fought for the Continentals often did so because they were at war with a tribe that happened to support Britain. In his book Three Peoples, One King, history professor Jim Piecuch writes about terrorist tactics that the Continentals and especially patriot militias used to keep Indians from joining with slaves (who were often offered freedom if they escaped and joined the Crown forces) and loyalists. Piecuch estimates that King George III might have had several tens of thousands more fighting men at his disposal, had Indians, loyalists, and slaves been able to join the redcoats consistently. Yes, Suzanne. It was an unpopular war waged by a wacko king. England didn't have much luck with Georges I'm afraid. I don't know if it was the way history was taught when I was a kid or how I perceived things. But everything was black or white, good or bad. It took years to get past those perceptions. Wonderful post Suzanne and so very true--the winners write the history. My current area of study is the American Civil War (my WIP is set in New Orleans during the war). Talk about skewed history! Here we are 150 years later still debating some of the same issues regarding civil rights for "others"...try being a southerner and arguing that the economics of slavery was a major reason for secession. And these days, states are once more arguing they can defy federal laws (oops, climbing off my soapbox LOL). Glad to see the shout-out to Kenneth Roberts, pretty much forgotten now, but one of the best hitorical novelists writing about the Colonial and Revolutionary War periods. Jack Getze, please email me at lindalynetterodriguez (at) gmail (dot) com with your mailing address, so I can send you your copy of EVERY BROKEN TRUST. Thanks! Loyalists also moved to the Bahamas. I spoke to the descents of one family when I visited there. What did you think about President Obama's one-liner at the correspondents dinner...that he was thinking of setting up his presidential library in his home town..but then decided it would be better if it were in the United States? SO funny! Pat D, I wonder whether teachers taught in black and white because a) they thought kids didn't have the capacity to understand gray, or b) it was faster that way? Linda, I know that you know that the Revolutionary War was actually the Civil War, Part 1 -- especially in the south. Linda Rodriguez, Kenneth Roberts isn't forgotten. He's in many libraries on Goodreads. I saw one of his books on a list just the other day and realized that I had to write several more books to catch up with him. Warren, yes, loyalists went to the Bahamas and all over the Caribbean, Canada, Britain, and even Africa. Those few who kept a low enough profile and had decent neighbors even remained in their homes in America. Hank, thanks for popping in! What percentage of people who heard Obama make that comment didn't get it? We were always taught in school that the Redcoats lost the war because of the stubbornly straight ranks they kept while walking right into the line of fire - and also, of course, the red coats that made them highly visible in battle. Smear campaign? Lol, you know, being American, I never thought about it. It is all too easy to belittle the enemy! Recently I have begun reading more novels based in this time period, and have been amazed by how much I really didn't know about the Revolutionary War. Like all of history, it was made by real men with ordinary problems, relationships and emotions. o Their supply lines were stretched too far and subject to interruption from the opposition. o The foreign-soil disadvantage. The redcoats were surrounded by civilians who resented the war's disruption to their lives and/or Britain itself. o Alpha-male disagreements between generals. o General over-extension. The American War was just one front in a world war. Check out this essay, and click on the map to see that what began as posturing and scuffling between Britain and her American colonies exploded into a war of international and naval significance: multiple powerful countries, multiple continents, multiple theaters. The image our history texts leaves us of trounced redcoats slinking back to Britain in 1783 with their tails between their legs is also skewed. When Britain cut its losses and abandoned the most costly theater of the world war in 1783, it was still the most powerful nation in the world. If that weren't so, Britain wouldn't have been able to stop Napoleon's machine just a few decades later. The smear campaign I get most annoyed with is the strongly-held belief that people came from England for freedom of religion and they were escaping persecution by the king. Most came for land and financial success. The King promoted settlement of New England and funded the trip from Leiden. Not too many years after arrival they began a college to educate the Native people of the area (a promotional gimmick to raise money back home in England) and to provide themselves with an educated ministry without having to send young men back to England for their theological education and ordination. Approximately 50% of the New England settlers failed to prosper financially and went home to England. Related to that is the portrayal of the people as fundamentalists who enforced all sorts of strict behaviors on one another, such as the myth that everyone was forced to go to church. on the contrary, if you weren't up to it they didn't want you there. It was very difficult to join the early "congregational" church. Everyone had to pay taxes to the church in the area where they lived, but if they went to another church they often argued that they should not have to contribute to the support of both. This was common in Salem, Massachusetts when those who did not like the way things were going in the church there, would go to the church in Marblehead. There are many Essex County court records from the seventeenth century that refer to such disputes. When I was at Oxford researching the history of the church from England to America, I discovered a few of Henry VIII's exegeses. They were very theologically informed and actually brilliant. It appears that he'd been preparing for the priesthood when his older brother died... end of theological aspirations. I know he did terrible things, but his theology regarding the distribution of power was, well it seems it was to me, based on his early theological inquiry into church as government and that if the church were going to govern, it out to be run by the various heads of state. Interesting side note (for me, at least) was my 13th great-grandfather's presence in Bosworth at the time of the battle. Most came for land and financial success. And thus power. But all that didn't sound noble, so the focus shifted to religion. Reine, have you read author M. E. Kemp's take on Puritans? Check this short essay out. Did your ancestor survive Bosworth? Suzanne, this post is fascinating (and so are the comments)! It could practically be published as research. My current WIP deals with a reenactment of the War of 1812, and part of the conflict is over a favorable presentation of a British admiral who got lots of bad press in the U.S. Among the histories I've collected is one published in England, with a much different view of the man, and I'm using that as well. I'll have to go over that again with this blog post in mind! My ancestor did survive Bosworth, because he was alive in 1540. It's pretty clear the family was on the Tudor side. His 4th great-grandson was a forman of the jury during the Salem witch trials. His grandson went to Canada and became French. My great-grandparents returned to Salem, never knowing their English ancestry. I will read your suggestions... thank you! I studied puritan history with David Hall, so I'm very influence by his work and opinion. Suzanne, that's always the way, isn't it? I just got lucky and had ancestry through Québec where excellent records have been maintained over the centuries. Bertrand Desjardins of Institut Drouin helped make that the Paine/Salem connection. I learned about family local history at Oxford where it is highly valued, while here in the States it is "just genealogy." Sounds like an interesting and original book. Elizabeth Peters wrote a book called The Murders of Richard III. I have the Daughters of Time, too, but haven't read much Tey yet. Sorry my post above wasn't meant to be anonymous. Michelle, I haven't read Peters's book, but I think you will enjoy Tey's book. The first 30 pages are a little slow, but it's quite interesting after that. A big thanks to the Jungle Reds for hosting me! I write historical mystery and suspense set in my home state of Mississippi. My most recent novel, Camellia Creek, is set near the close of Presidential Reconstruction (November-December 1865) shortly before what I consider to be the end of the Republic—that being Congressional Reconstruction, if one doesn’t actually date it from General Lee’s surrender at Appomattox. The myth that the War Between the States was fought over slavery is one of the most pervasive examples of victors writing history to suite their concept of themselves and the righteousness of their cause. Nations don’t go to war for “goody two-shoe” reasons. The underlying reason—whether aggression or defense, will almost always prove to be economic. But I digress. Back to Reconstruction, when tax-payer elected civil governments across the South were swept aside for martial law under the guise that the Southern states were trying to reinstitute slavery (the Black Code). Have the people touting that excuse today ever read those codes AND compared them to vagrancy laws/orphan laws in the North of that period? Martial law was instituted across the South almost three years following hostilities despite favorable reports from occupying generals and Northern newspapers not under the influence of the Republican Party. What the Republicans really wanted was passage of the Fourteenth Amendment, which could only be achieved by putting in place state governments supporting the Republican Party—and believe me, those did not exist in the South. Hence, the creation of puppet governments across Dixie. The Fourteenth Amendment is a desecration to the Constitution, and the manner in which it was passed, testimony to the tyranny rampant during the period. Today, the powers stolen from the states and usurped by Congress are accepted as the normal state of things—the Tyranny of Democracy I believe our Founding Fathers referred to it. They also went to great lengths to avoid it. So today, 47% of the population now votes itself other peoples’ money, but it was not always that way. The South, which wanted nothing more than its independence, knew that.